There is so much wonder and miracle and joy in being pregnant yet in our culture it is not revered as it is in so many others. I visited Bali when I was 3 months pregnant and was treated like a queen. Women around the world are honoured and cared for when they are carrying a baby. Being a mother is considered very important and special and it begins during gestation, not just once the baby is born. I was blessed to have a dear friend and mentor hold a sacred circle for me when I was pregnant. I had wanted a baby welcoming – a ceremony to let the baby inside me know that not only I was welcoming it into the world, but that my family, friends and the wider community were holding a special space for them. These ceremonies again are common in many cultures. Blessing ways are held for the mother, to honor her body and heart and to pamper and prepare her in union with a group of women until the birth of her baby. My workshops combine the two. During the full day workshop both mother and child are honored in ceremonial bliss and exploration. Small groups of pregnant women join and together we explore the changes in body mind and soul, we share, divulge and invite discovery of fears, wishes and hopes for the future. 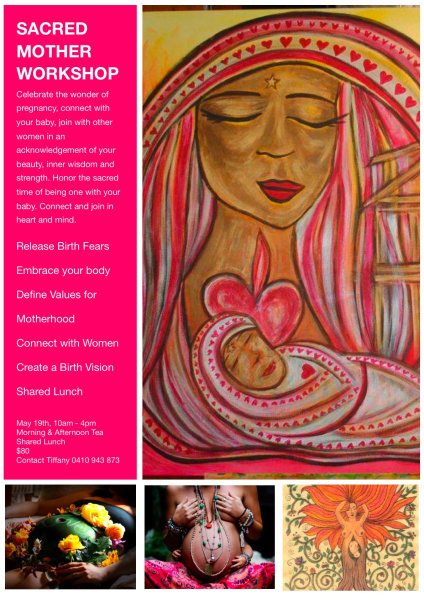 The workshop is creative and calming, mixing meditation with music, art, fun, food and connections with self, baby and other women. It is a true opportunity to take one day out just for you, to connect with yourself and with your baby before your world becomes changed forever. Please join is. Contact me for more details or register your interest below.